Elbit Systems of Australia Pty Ltd has hosted at its facility in Canberra the Australian Minister for Defence Industry, Christopher Pyne MP, Senator for the Australia Capital Territory, Zed Seselja and the Chief of the Army, Lieutenant General Angus Campbell marking the award of Tranche 2 of the Australian Army’s Land 75/125 program. Elbit Systems reported this contract award on September 27, 2017. The program is the extension and enhancement of the Australian Army’s Battle Management System (BMS) originally procured under the Land 75/125 Program. 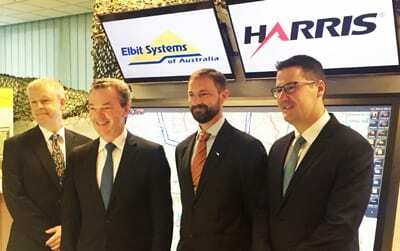 Elbit Systems is the prime contractor of the Australian Army’s BMS and it supplies, integrates, installs and supports the Battle Group and Below Command, Control and Communications (BGC3) system for the Australian Army’s Land 75/125 program. The BGC3 is comprised of a BMS for soldiers, Vehicle Mounted Commanders and Headquarters/Command Post Staff. The project will be performed primarily by ELSA, employing over one hundred engineers across several company sites. The way wars are fought on the modern battlefield will be revolutionised with the new Battlefield Command System for the Army. Minister for Defence Industry, Christopher Pyne MP and Minister for Defence, Senator Marise Payne today announced the approval of the Land 200 Tranche 2 Project. “Together they form the Battlefield Command System, which allows commanders to plan, monitor, direct and review operations in real-time,” said Minister Pyne.